Pain is a unique experience, which requires careful assessment to prevent or control. Your healthcare provider will work with you to devise a pain prevention and management plan to meet your pain management goals. The management of your pain will require pain medication ranging from mild to very strong narcotics. It is important to take pain medication on a regular schedule. Comfort is more readily achieved when the level of pain medicine in the blood stream remains constant. 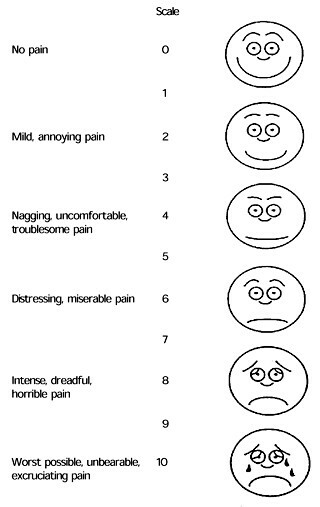 Pain Assessment Scale - Uses numbers 0-10 to rate pain. Constipation: A long-term effect of narcotic therapy that can be managed. Nausea/Vomiting: Usually a short-term side effect usually lasting 3-5 days, as your body is adjusting to something new in its system. Drowsiness/Sleepiness: This is a short-term side effect usually lasting 3-5 days. Your dose will be adjusted as needed to meet your pain control goals. Confusion: This is a short-term side effect lasting 3-5 days. You may feel euphoric, disoriented, confused. Difficulty with urination: If you have difficulty urinating or are unable to urinate over any 8-10 hour period, please call your healthcare provider. Is it important for healthcare providers to constantly ask about your pain? Yes. This is because pain changes over time or your pain medication may not be working. Healthcare providers should ask about your pain regularly. What do you need to tell your healthcare provider about your pain? What can you do when your pain gets worse? Tell you healthcare provider. Tell them how bad your pain is or if you are in pain most of the time. Let them know if your pain medication is not helping. What can be done to treat pain? There are many ways to manage your pain. There are medicines that can relieve pain. Some pain medications are acetaminophen, aspirin, ibuprofen, naproxen and opioids. Opioids include morphine, oxycodone and hydromorphone. Many of these medicines come in pills, liquids, suppositories and skin patches. Some pain may be treated with medicines that are not usually thought of as pain relievers, such as antidepressants and Methadone. Are there other ways to relieve pain? Taking your mind off the pain with movies, games and conversation. Are you afraid that your pain medicine won't work if you take it to long? This is called tolerance. It means that after a while your body gets used to the medicine and you need to make a change to get pain relief. You may need more medicine or a different kind of medicine to control your pain. This website is for informational purposes only and not intended as medical advice or a substitute for a consultation with a professional health care provider. Visiting Health Services of New Jersey and all related marks, logos, designs and slogans are registered and/or common-law trademarks and service marks of Visiting Health Services of New Jersey, Hackensack Meridian Health, and St. Joseph's Health.